From experiencing live music under the stars at an outdoor amphitheater, to rocking out at an arena, or taking a road trip to a music festival, there is something special about summer concerts. 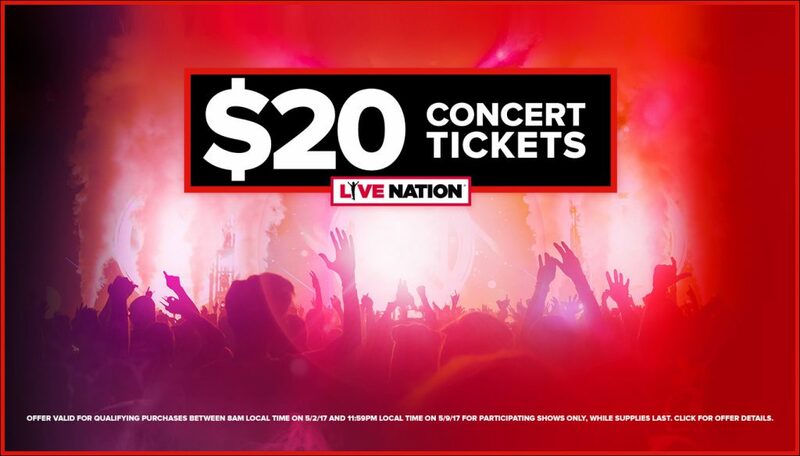 That’s why Live Nation is celebrating the start of the season with National Concert Day on May 1, as well as the “Kickoff to Summer Ticket Promotion,” which offers over 1,000,000 tickets to some of Live Nation’s summer tours for just $20 (that’s all-in, no additional fees). Tag social posts with #NationalConcertDay and let us know what $20 tickets you scored! In celebration of National Concert Day, for one week only, Live Nation is launching their “Kickoff to Summer Ticket Promotion” by making over one million tickets available for just $20. There will be tickets for 50+ tours and 1000+ shows at venues across the nation. The general on-sale for the “Kickoff to Summer Ticket Promotion” begins Tuesday, May 2 at 8am local time, and continues for one week through Tuesday, May 9. See below for a highlight of performers offering $20 concert tickets, and visit Ticketmaster for more information and to purchase tickets. AT&T is bringing customers to the front of the line for the “Kickoff to Summer Ticket Promotion” with AT&T priority presale ticket access beginning Monday, May 1 at 10am local time through the AT&T THANKS program. Additionally, on National Concert Day, Live Nation is producing a special concert in New York City at Irving Plaza presented by State Farm. This year’s celebration features performances by Jason Aldean, Foreigner, The Roots, Daughtry, Prince Royce, and Nickelback. Prior to the performance, several of the artists will stop by to chat with media about their upcoming summer tour including, OneRepublic, Rob Thomas and Paul Doucette (Matchbox Twenty), Joan Jett, Adam Lambert (Queen + Adam Lambert), Phillip Phillips, Stephan Jenkins (Third Eye Blind), John Rzeznik (Goo Goo Dolls), Mike Einziger and Brandon Boyd (Incubus), Straight No Chaser, Scott Bradlee (Postmodern Jukebox), Adam Duritz (Counting Crows), Cheap Trick, Jason Bonham, The KIDZ BOP Kids, and more. The National Concert Day event will be hosted by NBC’s Lilliana Vazquez. Continuing the celebration of National Concert day, and launching the on-sale for the “Kickoff to Summer Ticket Promotion,” OneRepublic will perform live on NBC’s TODAY Show on May 2. Nationally Touring Artists Included in Live Nation’s $20 “Kickoff to Summer Ticket Promotion” For a full list of artists, please visit Ticketmaster. To see a complete list of Live Nation’s summer tours and festivals, please visit Ticketmaster.